Our team here at iFamilyKC is so excited to bring you exciting opportunities, share fun events with you, and introduce you to incredible resources all across the metro area every single month. One of my favorite things that we do is spend time with you out in the community. Did you know that we host exclusive iFamilyKC Kids Club events several times throughout the year (we average at least once a month!) at more than 50% off regular pricing for these activities?! Learning2Fly is located off of i-35 in Mission and the building is as unique as the classes they offer for kids and adults. The studio has a really calming energy to it is so warm and inviting you can’t help but feel at home as soon as you step in. The instructors at Learning2Fly focus on seven habits of good health in everything that they do. The main floor of their building focuses on physical health with silk rope suspended from the ceiling where participants can practice aerial yoga and other classes at the studio. The upstairs area has other silk ropes and a large space for learning and craft time, which the kids got to experience during the event. Having good pyhsical health is such an important thing in life, and teaching our kids ways to keep our bodies healthy is an important life skill that will set them up for success later in life. 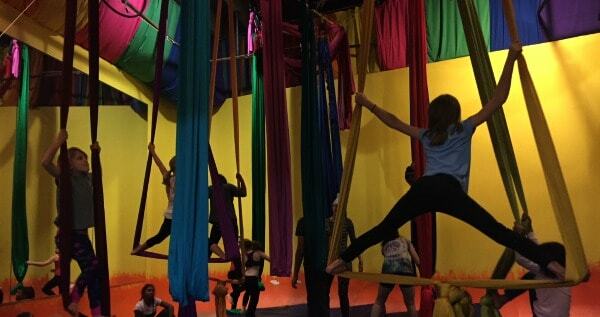 The aerial fitness classes for kids that are offered at Learning2Fly aim to help kids maintain healthy, strong bodies by engaging them in fun workouts that the kids really enjoy. My own six year old made a comment as she was climbing the silk ropes at the studio, “this is hard,” she said. The instructors response was amazing and was a valuable life lesson in and of itself. She said, “It IS hard but YOU can do it!”. 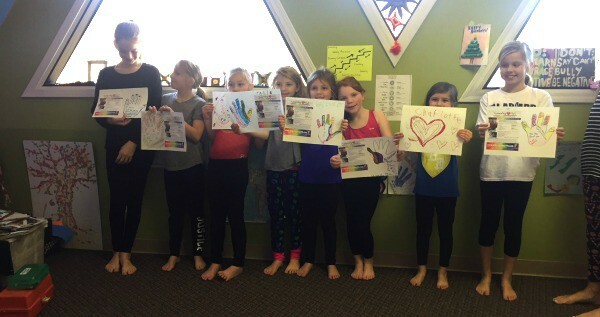 Learning2Fly focuses on 7 habits of healthy bodies – from the inside out. 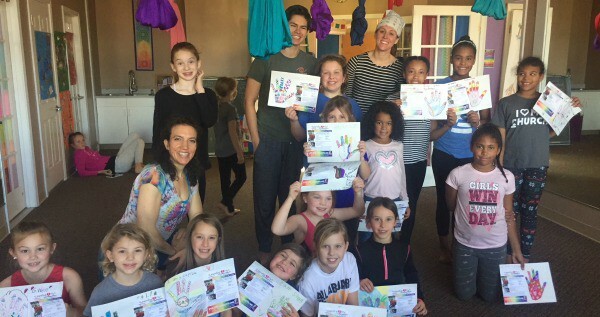 The kids truly learn that they are creative beings, and what that means for their lives and our community, during art sessions at the studio. During the event, the kids spent time creating motivational artwork that they took home with them as a reminder that they are strong. Learning 2 Fly offers classes, camps, and parties for children and adults of all ages and skill levels and I’m excited to go back and experience more of what they have to offer. Grab more details about classes, camps, and MORE at iAmLearning2Fly.net.